266 3/1/1873 Turner, A. B. Cumberland Consolidation Coal Co.
478 9/4/1873 Tyler, Julia Maryland Consolidation Coal Co.
502 4/13/1874 Uhler, Peter G. New York American Coal Co.
275 3/1/1873 Uno Cumberland Consolidation Coal Co.
276 3/1/1873 Van Tassell, Catherine Cumberland Consolidation Coal Co.
277 3/1/1873 Varnum, J. B. Cumberland Consolidation Coal Co.
287 3/1/1873 Wade, Henry, Jr. Sharpsburg Elias Wade & Bro. 448 4/14/1873 Wallis, G. W. New York American Coal Co.
293 3/1/1873 Walters, C. F. Sharpsburg J. C. Grive & Bro. 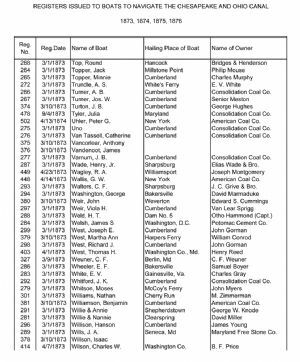 284 3/1/1873 Welsh, James S Washington, D.C. Potomac Cement Co.
292 3/1/1873 Whitford, J. K. Cumberland Consolidation Coal Co.
381 3/10/1873 Williamson, Benjamin Cumberland American Coal Co.
289 3/1/1873 Wills, J. A. Seneca, Md Maryland Free Stone Co.